I have a 2005 F150 Lariat 4x4 with the 5.4L and I had a problem with one of my coils and was able to get that fixed. I do not know how long it was not functioning but it was a while I am sure. With that said, I question my catalytic converters due to low fuel efficiency and the O2 sensor readings. The front sensors seem to be functioning normally and respond to changing conditions well. The rear ones both fluctuate quite a bit though. 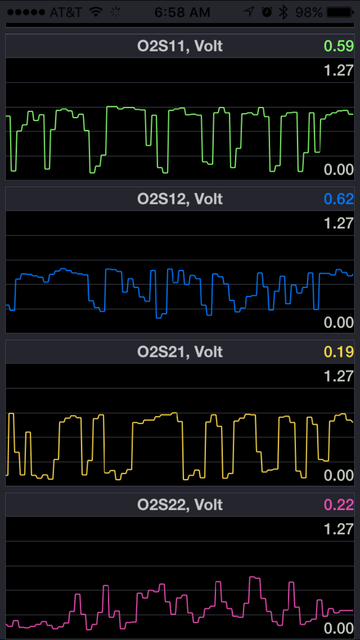 I am of the understanding that they should be pretty steady for voltage and not jumping between .08v and .7v. Would this make the cats suspect? I have also included a screen shot of the readings. Did you disconnect the battery when you worked on your coils? Did you do the relearn after? I ask because Im still struggling with a low MPG after doing coil work and the relearn. I did not do that. It started raining and I completely forgot in the scramble to get it done. We are moving so I had to borrow a driveway and tools. A relearn may help you. That will make the system relearn fuel efficiency with the new parts.